This striking work of graphic journalism pairs previously unpublished creative nonfiction by Charles Bowden with provocative scratchboard drawings by Alice Leora Briggs to create a vignette of daily life in Juárez, Mexico, in all its surreal brutality and beauty. What do you call a place where people are tortured and murdered and buried in the backyard of a nice, middle-class condo? Where police work for the drug cartels? Where the meanings of words such as "border" and "crime" and "justice" are emptying out into the streets and flowing down into the sewers? You call it Juárez or, better yet, Dreamland. Realizing that merely reporting the facts cannot capture the massive disintegration of society that is happening along the border, Charles Bowden and Alice Leora Briggs use nonfiction and sgraffito drawings to depict the surreality that is Ciudad Juárez, Mexico. Starting from an incident in which a Mexican informant for the U.S. Department of Homeland Security murdered a man while U.S. agents listened in by cell phone—and did nothing to intervene—Bowden forcefully and poetically describes the breakdown of all order in Juárez as the power of the drug industry outstrips the power of the state. Alice Leora Briggs's drawings—reminiscent of Northern Renaissance engraving and profoundly disquieting—intensify the reality of this place where atrocities happen daily and no one, neither citizens nor governments, openly acknowledges them. 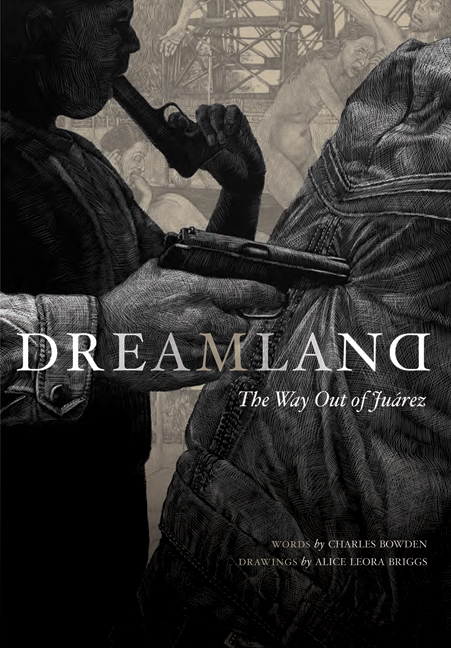 With the feel of a graphic novel, the look of an illuminated medieval manuscript, and the harshness of a police blotter, Dreamland captures the routine brutality, resilient courage, and rapacious daily commerce along the U.S.-Mexico border. Charles Bowden is a long-time observer of social issues on the U.S.-Mexico border. His recent books include A Shadow in the City: Confessions of an Undercover Drug Warrior; Down by the River: Drugs, Money, Murder, and Family; Blues for Cannibals: Notes from Underground; Blood Orchid: An Unnatural History of America; Desierto: Memories of the Future; Inferno (with Michael Berman); Exodus/Éxodo (with Julián Cardona); Trinity (also with Michael Berman); and Some of the Dead Are Still Breathing: Living in the Future . Alice Leora Briggs has exhibited her drawings and architectural installations in museums, galleries, and nonprofit spaces across the United States and in Europe. Recent fellowships and grants include awards from Border Art Residency, Jentel Foundation, Phoenix Office of Arts and Culture, Arizona Commission on the Arts, Contemporary Forum and Cummings Endowment Fund, Phoenix Art Museum, Tucson/Pima Arts Council, Larry E. Elsner Art Foundation, and Dallas Museum of Art's Otis and Velma Davis Dozier Travel Grant. She lives in Lubbock, Texas. "With His Pistol In His Hand"